This sweet recipe is lighter than some fudge recipes with a milkier, creamier finish. If you prefer a denser, darker fudge, you can add a little cocoa powder with the chocolate. Grease an 8x8-inch baking dish. Put the milk beverage and sugar in a medium saucepan over medium heat. Bring it to a boil, while whisking. Boil for 7 minutes, whisking often. Reduce the heat if it threatens to bubble over. Remove the saucepan from the heat, and stir in the buttery spread, chocolate, and vanilla until smooth. Scrape the chocolate mixture into your prepared baking dish and level it out. Refrigerate the fudge for several hours, or overnight, to set up. Once set, cut the vegan chocolate fudge into squares. 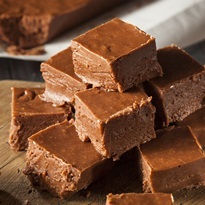 Store leftover fudge in the refrigerator for up to 1 week, or freeze it to enjoy later. *Soymilk beverage and milk beverages with added protein can "curdle" when boiled. It can usually be whisked until smooth, but you might prefer to use another type.